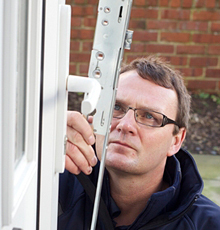 The average lifespan of a upvc door locking mechanism is 10-12 years. Will this mean a new door is required if yours has failed? Not at all. We can replace all the broken parts with original ones and you will have another 10-12 years of use out of your perfectly good existing door. All work is guaranteed and we can be with you the same day you call. Don't buy a new uPVC door when we can repair your existing door. The locking part of a uPVC and composite door is called a multipoint lock. This is operated when you lift the handle and then secured after turning the key in the barrel. This mechanical part of your door is subject to wear and tear after many years of use and will eventually cease to work. This can leave you with either a door that will not open or will not lock and is unsecure. If you turn the key and it will not open or if the handle does not budge at all there is every chance that the multipoint lock has failed. The good news for you is that this does not mean you need a new door though double glazing installers will no doubt tell you that the parts are no longer available if you call or visit them. There are times that this is true but there is always an alternative multipoint lock for your door which will give the same amount of security as before or even higher. We achieve this by having direct access to three of the largest suppliers of multipoint locks in Europe. This allows us to be able to always repair existing doors and with our mobile workshop carrying the vast majority of these multipoint locks, we can guarantee that in 99% of cases your door will be repaired the same day we visit. Replacing faulty multipoint locks is the main part of our business and as experienced locksmiths it will not matter if the door is closed and you are unable to open it. Our knowledge in this department is vast and will not be an issue. No damage to the door will be incurred during the opening of the door. SF Locksmiths can save you lots of money? A new uPVC door can cost in the region of £700 including the fitting and up to £1300 for a higher quality door with extras added on like side panels, decorative inserts and leading. The cost to replace a multipoint lock with a new one is in the region of £130-£170. This price includes all the materials, labour and vat and comes with a two year guarantee. At the time of fitting new handles and barrel can also be exchanged and these may also be part of the original quote. We would expect this repair to last equally as long as the original if not longer if the door was poorly fitted in the first place. The door will be checked for any alignment problems at the time of fitting as well and the door hinges serviced to prolong their life. As you can see there is potential for huge savings over the purchase of a new door. We understand that this can come at a time when it can inconvenient as you may be going to work or locking up before bed. For the benefit of our Rotherham customers we offer a same day call out. We will quote for an approximate cost of the repair over the phone and on arrival an exact quote before commencment. All work is guaranteed and payment is taken only after you are completely happy with the repair. Payment can be via a debit card, cheque or cash and a full written receipt is always left with future contact details on. Invoices can be arranged if the work is arranged on behalf of a landlord or letting agent.